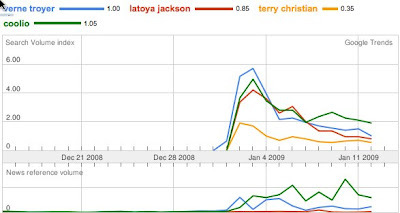 Here is a quick cut from Google Trends looking at who I consider to be the four main players in CBB. The initial spike is to be expected but what stands out is the sustained interest in Coolio. I think a lot of that will be due Gangsta's Paradise being dusted off but he is certainly making an impression which is not always a bad thing. One to watch out for if he makes the last few as a possible bet for second (if possible - I haven't checked). Big night for Verne tonight, he has been treading water a little. I am sure I am not the only one concerned with his lack of action. I want him to go out and grab this competition with both hands. The Teddy Bear costume will help. Saying all that, I haven't laid off yet though and he probably offers good value at the moment after his micro drift. Channel 4 are also showing Goldmember in the next week which will help.